Growing raspberries is not only a great way to provide yourself with the easiest of homegrown fruits, it’s a great way to powerpack your diet with vitamins, antioxidants, anti-inflammatory agents, anti-cancer compounds, and even a substance called "rheosmin" which is currently being researched for its anti-obesity potential. Studies have shown that these health-giving substances are at their peak only in fully-ripe, organically-grown, really fresh berries, so the only way to reap the full health benefits is by growing raspberries yourself! Good thing these delicious little gems are so easy to grow. And if you plan it out with careful attention to varieties, you'll be able to harvest your own raspberries for three to six months out of the year in most areas. If you choose appropriate varieties, growing raspberries is possible down to USDA Hardiness Zone 3, where winter temperatures can drop to -40 degrees F.
Raspberries prefer slightly acidic soil - ideally a pH of 5.6 to 6.2 – but where I live our soil is a bit alkaline at 7.5, and our raspberries are prolific producers. What raspberries won’t tolerate is wet soil, at least not for long. If you live in a very wet climate or are thinking of planting raspberries in a low or soggy part of the yard, one solution is growing raspberries in raised beds, which drain well because they are above ground. If raspberries “get their feet wet” for very long they are very susceptible to root rot, particularly verticillium. Raspberries appreciate a generous dose of good quality compost when they are first planted, and annual applications of compost after that. Growing raspberries successfully requires knowledge of their particular growth habit. They come in two main types: summer bearing and everbearing (sometimes called fall bearing). Summer bearing raspberries have perennial roots, but send up canes (stalks) that are biennial, meaning that the cane lives two years and then dies. The first-year canes sprout, grow leaves and put on height, but don’t flower or set fruit. In their second year, these canes sprout side branches which produce flowers and fruit. Then at the end of the second year, the cane dies. Everbearing raspberries do exactly the same thing, with one exception. The first year canes bear a small crop of fruit at their tips in the fall. In the summer of the second year the cane bears its usual crop of berries, then dies. If you are growing raspberries for the greatest overall yield possible, say for making jam or for freezing, grow everbearers - but prune the tops off the first year canes to prevent them from flowering. If they can't flower they will put all their energy into growing larger, and they will bear an even larger crop the following summer. 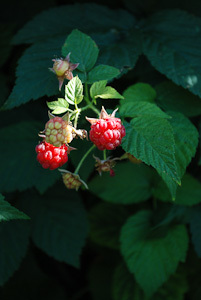 By planting a “variety of varieties” – for example, an early-summer bearer, a mid-summer bearer and an everbearer (fall) -- you can spread your raspberry harvest out over the whole growing season if you wish. Raspberries come in yellow, red, purple and black varieties. Don’t confuse black raspberries with blackberries, they’re not the same. Black raspberries are soft and velvety like other raspberries, whereas blackberries are shiny, firm, and often larger than their counterpart raspberries. Purple raspberries are a cross between red and black raspberries, and have some of the characteristics of each. Red raspberries are the hardiest varieties, while purple and black varieties are better suited to milder climates, generally above 5 degrees F.
One of the most important factors in successfully growing raspberries is choosing appropriate varieties for your climate. This is why buying stock from big box stores like Home Depot is not such a good idea – they tend to sell the same stuff nationwide. So check with both your local state extension office and a good local nursery to find out which varieties do best in your area, and stick with their recommendations. Since raspberries are so susceptible to verticillium fungus, you should consider varieties that are bred to be disease resistant. Also avoid planting them where tomatoes, peppers or other nightshade-family plants have been grown, which can harbor the same fungus. Growing raspberries successfully requires choosing a good site and giving some careful attention to soil preparation prior to planting. Raspberries should be planted in single-file rows for ease of access during pruning and harvesting and to make trellising easier. Plant red raspberries about 2 feet apart, and purple or black raspberries about 3 feet apart. Allow the raspberries to fill in the row, but do not allow them to expand outward from the row. Keep them pruned (or even mowed) back when roots creep outward and send out shoots, or they will end up taking over the Universe! If you are going to be growing raspberries in more than one row, give yourself at least 5 feet (or even 6 or 8 feet if you can spare the room!) between rows. Trust me, you will need more room than you think to navigate between rows comfortably when it’s time to harvest berries, weed, or cut back. Raspberries need to be trellised in order to get enough sun and to be accessible for harvest. If they aren’t trellised, the canes bend over under the weight of the berries and many berries will rot on the ground. There are a couple of good ways to trellis raspberries. The first way is to make something that looks like an old-fashioned, double-line clothesline strung between two “T”s, one T on each end of the bed. Between these are strung two wires at the ends of each crossbeam, which the canes hang over. The “T”s can be constructed out of cedar fence posts, and should stick up above the ground about 4 feet. The crossbeams should be about 18 inches wide. Set the posts 18-24 inches into the ground (total length of post 5½ to 6 feet), and anchor them with stakes and wires to prevent their being pulled over by the weight of all the raspberries hanging over the wires. An easier but uglier way is to just pound two metal fenceposts into the ground, 18 inches apart, at each end of the bed. String wires between them lengthwise along the bed to support the canes. This is how Tito and I are growing raspberries. We pounded the stakes in at about a 60-degree angle instead of vertically, to give them extra resistance to being pulled over by the raspberries they are supporting. If you have a very long bed and the wires start to sag in the middle, you can pound in two more posts halfway down the bed. These middle ones can go in vertically. Personally I am a fan of double-digging all my garden beds prior to planting, but if it’s your style you can rototill or just fork up the bed, making sure to carefully remove all weeds by the roots and to incorporate a couple of inches of good compost. Put a handful of this mix, along with about a quart of good homemade compost, into each hole at the time of planting. At the end of the season, raspberries should be weeded, but I leave pruning until late winter or very early spring. This allows any life energy remaining in the cane in the fall to slowly be drawn back down into the roots and stored for the winter. Be sure to prune in late winter before this energy starts back up into the canes. 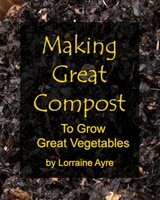 Cut down any suckers that are sprouting up “outside the line” of the 6 or 8 inch row centers. Spring is the time to cut off any 2-year old canes (now really 3 years old) that are now dead. You can tell the old canes from the new ones by color: the old ones will be brown and peeling, and fairly obviously dead. After pruning, pull back the mulch and apply another good dose of compost and a handful of fertilizer, replacing the mulch on top. Weed again if any new weeds are sticking up their heads. Again, if you want to focus on just a single, prolific crop in the fall, cut off the growing tops of your first-year canes to prevent them from early bearing. So that's the basics of growing raspberries. I hope you will indeed start your own patch, because for the little bit of work that it takes the first year, you will be rewarded for decades with delicious, almost carefree raspberries. Bon appetit, and happy gardening!